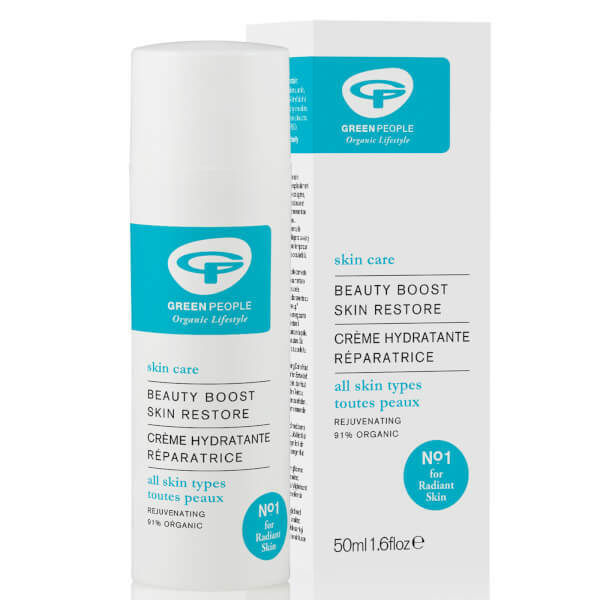 Rejuvenate skin in need of an overall boost with the Green People Beauty Boost Skin Restore; a certified organic rescue cream formulated for all skin types, that combines all the magic of a facial in one luxury treatment. Infused with a natural uplifting aromas of organic Ylang Ylang, Mandarin and Ho Wood essential oils, the award-winning moisturiser drives the combined benefits of Wakame (an antioxidant-rich seaweed), Everlasting Flower and Green Marine Macro Algae into skin. These ingredients work in synergy to stimulate skin-firming collagen synthesis, neutralise damaging free radicals that cause ageing, and penetrate intense hydration to deeper skin tissues, respectively, leaving you with a soft, radiant and plump complexion. Aplicar una cantidad del tamaño de un guisante en el rostro y el cuello después de haber limpiado y exfoliado la piel. Utilizar dos veces a la semana como tratamiento o cuando la piel necesite un estímulo.